It was done by Kit Foster, and before I say anything else about it, let me say this: Kit Foster is incredible to work with, and his rates are quite reasonable. He didn’t ask for a deposit ahead of time, he had three working images to me by the end of the first week, and he was extremely responsive to feedback. Working with him was a pleasure. If you’re looking for someone to do a cover for you, check him out. So, why the change in cover? Well, that’s kind of a long story. 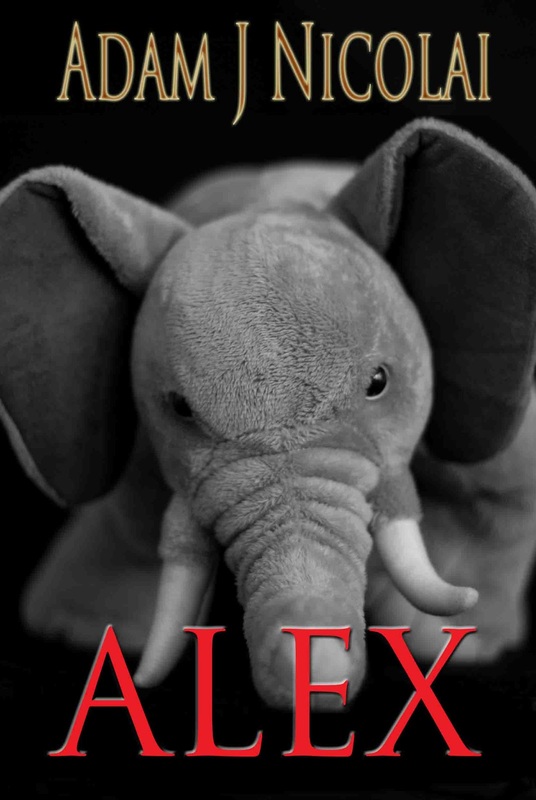 When I first published Alex, it included my first stab at a cover, which was basically a very nice photograph of Mr. Tuskers (thank you, Jason Godfrey) and a couple extremely basic text labels for the title and my name. Actually, the first person to really say to me, “You need a new cover,” was also the guy who recommended Kit Foster. That would be Griffin Hayes. Griffin – maybe it took me more than a year, but I did take your advice. Thanks. In my defense, I did eventually gussy up the existing cover with some nicer-looking text labels for the title and author name. I am still quite fond of that J. It looks all badass, like a dagger. This looks a little better, obviously, even if the text style does remind me of something you’d see on an early 90’s Grisham novel. Of course, there’s still very little going on in terms of overall styling, and there’s a good reason for that: I have no idea how to do it. I feel the need now to defend the cover image. I’m going to go ahead and indulge that need. This stuffed elephant is actually my son’s. He’s had it for years. Some of this comes through in the image, but this elephant looks seriously pissed when you look at it in person. It is unlike any other stuffed animal I’ve ever seen. It was, in fact, the inspiration for the Mr. Tuskers animal in Alex. We don’t call it by that name in the house (one of my wife’s requirements, which I completely agree with), but this guy is Mr. Tuskers. Some people see it. In some of my Amazon reviews, and plenty of times in person, I’ve heard people say the elephant looks fierce or angry. I believe it takes on more animus the longer you look at it. The god’s honest truth is, I love this image. It speaks to me on a lot of levels, and I think it represents the novel Alex admirably. It’s a stuffed animal, so it evokes the idea of a child. It looks angry, betrayed even, which to me symbolizes the overall feeling of the book, particularly Ian’s constant pain and rage. And of course, it represents an object/character which actually makes an appearance in the novel, albeit not until the last 40% or so. Now, I’m the author, my son owns this stuffed animal, and this photo was taken by a friend of mine. There’s a whole lot of bias there. I recognize that. I won’t lie: there may have been a wounded pride issue that kept me holding on to this cover, too. Alex sales were particularly excellent over the summer and into the early fall, and that whole time, it was rocking this cover. So it was easy for me to say, “No new cover needed.” That may have even been true. A number of reviewers mentioned that they liked the cover – some even said they were drawn to the book because of the cover. For better or worse, it’s a unique cover. That much is certain. But ultimately, it does still look like it was done by one dude with a passing understanding of Photoshop, and that’s because, of course, it was. About a month ago I got an email from a fan who mentioned how much she loved Alex, but also mentioned that she almost didn’t buy it. I asked her why, and she said the cover had looked too cute to her. This was not the first time I’d gotten this feedback, mind you. Sales have been dropping off on Alex since November or so, and getting data on why people are passing up the novel is extremely difficult. I don’t have a marketing department or a whole lot of previous experience to draw upon. When I got this email, I had a realization that finally helped me break my inertia on the cover. Books change covers all the time. Getting a professional cover didn’t mean abdicating my love for Mr. Tuskers. It just meant that I was switching things up to see if a new cover would pull in the audience that the old cover couldn’t. I remembered what Griffin had told me a year ago, and after a few emails with him, decided to approach Kit. When I was first doing the Alex cover in 2011, I had the idea of doing something with a playground, but lacked the imagination or skill to make it work. I mentioned it as a possibility, along with a couple other ideas. In the first batch of three images Kit showed me, this was one of them, and it grew on me fast. Here’s why. It’s light, where the current cover is dark. Nothing creates a shift in presentation quite so viscerally, so I’m fond of that since a new presentation is the whole idea. There is a very stark contrast with the old cover, which I’m hoping will make people take a second look at that 4.7 rating and click the link. I like the image as well. While it’s not a scene from the book per se, it does evoke childhood, and there is something profoundly lonely about the empty horsey ride. The image fades into white as it rises, which gives it a kind of ethereal look – again, very appropriate. The child’s handwriting for the title is apropos, and helps to tie in the idea that this novel is about a child. Finally, it just looks good. I can’t do this stuff; this was done by a professional, and it shows. Kit’s absolute awesomeness and ease to work with just seals the deal. I don’t think I’ll ever do one of my own covers again. In related news, I’m hoping to have a new cover for Rebecca by the end of the month. Yes, Kit is doing that one too. So, it’s been a long journey. I’m not sure I could’ve gotten here without taking the road I took. Wish me luck on the new cover. … and take care, Mr. Tuskers. It was great working with you. Excellent choice. I was very attached to Mr. Tuskers as well. 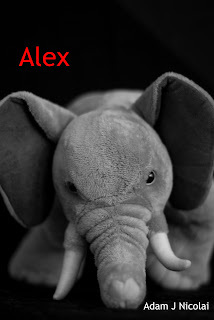 I think the new cover for Alex is great! I'm also glad you enjoyed working with Kit. He's honestly an awesome guy personally and professionally. I found him online over a year ago when he was just starting out. He offered to do a free cover for me. His work was so good I paid him anyway. Why covers do or don't work is still truly a mystery to me. I did feel bad suggesting the Alex cover could be improved and I see now how literally close it was to your heart. The book was selling quite well, however and I felt — rightly or wrongly — that it was doing well in spite of the cover. No doubt the book is amazing, I've read it, so I know. Time will tell what effect the change will have since what catches a readers eye can't always be predicted. I must have changed my covers at least twice already per book and will probably do so again in a year or two just to switch things up. Can't wait to see the new cover for Rebecca! The cover for Alex caught my eye and then I bought it. In fact I'd say Mr Tuskers is one of my favourite book covers ever. There's nothing cutesy in those eyes hahaha. The new cover is excellent, though I will miss Mr. Tuskers. Good luck, noble pachyderm! I foresee a long and prosperous movie career ahead of him, should he choose to pursue that particular avenue. His bit role in the film version of "The Road" was excellent. No, really, check out the scene at the cannibal farmhouse where the two main characters find all of those half-eaten people in the cellar. Kodi Smit-McPhee, as Viggo Mortensen's son, is clutching him throughout that sequence. It's a breakout performance. He'll be acting opposite the likes of Daniel Day Lewis soon enough! I downloaded your book for free a while ago just because it was free, but when I looked at it in my library I deleted it because of the book cover. When the book was free again with the new cover, I downloaded and just started on it two days ago. WOW! I love it so far. Hate to believe I almost missed out on a great story. Thanks for the cover change:) I'll def be buying your other book. Good luck in sales! Just catching up on your blog (thank Inc for nudging me back here!) and I wanted to throw in my 2c. 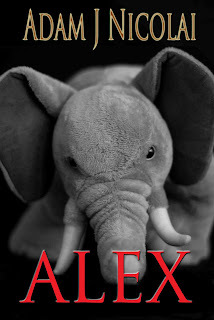 I loved the original cover for Alex – I spent chunks of the book wondering why there was a pissed off evil looking plushie elephant on the cover and then once we met Mr. Tuskers I fully understood. I thought he was a perfect “mascot” for the book and I too love his fierceness. The new cover though? It’s gorgeous. I’d be hard pressed to choose between the two. So I guess just call me a Mr. Tuskers fangirl.